In-House or Outsourced Medical Billing – Which Creates a Better Patient Experience? You would be hard pressed to find a physician that says they got into practice to deal with insurance companies. In fact, medical billing poses one of the most confounding problems in medical practices in this country. In order to continue providing care to patients, you have to have an income. An efficient, effective method of billing for both, the patient and their insurance helps achieve this goal. But as essential as this source of income is to the success of a practice, it cannot be a factor in patient care decisions. This conundrum often leaves clinicians questioning whether an in-house or outsourced medical billing process is better for the overall patient experience. With a little examination of the advantages and disadvantages of each, a clear-cut solution emerges. Changing authorization requirements, new and more effective coding procedures and insurance regulations are constantly evolving. Even the most dedicated, efficient in-house billing staff members cannot keep up with this constant influx of new information. This leaves many practices that utilize in-house medical billing behind on the latest billing and coding techniques that maximize payouts and minimize impacts on the patients. While large practices typically have a medical billing staff of several people, smaller practices may rely on the knowledge and abilities of one person. Billing errors, inefficient procedures and poor claims management often result in these situations. Outsourced medical billing, particularly with a software product, safeguards practices against the limitations of a human’s ability. 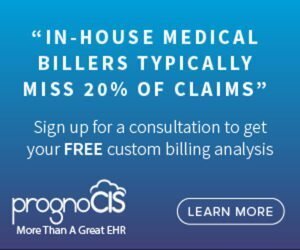 Updated with the latest in billing and coding procedures, insurance guidelines and billing best practices, software platforms like PrognoCIS help clinics bill patients and insurance more effectively. Billing errors are a thing of the past as clinic managers enjoy a simplified, albeit more efficient claims management process. It is often difficult for clinicians to understand how revenue cycle management affects their patient interactions. Still, understanding this relationship makes the decision of whether rely on in-house or outsourced medical billing easier. In a typical office visit, a patient has one interaction with a practitioner. Now, consider how many interactions that same patient has with office staff who are not the practitioner. For an office that uses an in-house billing staff, a patient may interact with a central appointment system, but will often interact with the person at the front desk, a medical assistant or nurse, a staff member who handles insurance authorizations, and another person who handles medical billing. If the person who checks eligibility or seeks authorizations is sick, on vacation or simply has an “off” day, the billing process is largely affected. Proper authorizations or eligibility requirements may not be obtained, statements not issued on time, and communications with the patient and their insurance companies stunted. What’s more, patients are often left in the dark about their account leading to a sense of distrust of the office, the staff and the provider. Now, consider an office who outsources their medical billing to a provider that offers revenue cycle management. Checks are in place to ensure state and specialty-specific billing guidelines are followed. There is a centralized call center to take patient inquiries, payments and denials. These are posted within 24 hours so patients always know where they stand. Denial management policies are in place so appeals can be made in a timely manner, and all claims are touched at day 30. With these systems in place, patients have account transparency which strengthens relationships of trust created in the exam room. In-house medical billing has a tendency to turn clinics into mock financial institutions. Care is provided on the expectation of payment through a third party (the insurance carrier). The clinic is, in essence, extending a temporary line of credit to the patient. Once a remaining balance is determined and due, the clinic requests payment from the patient. In the patient’s mind, they have moved from care provider to creditor, even though this is not technically the case. Outsourced medical billing allows a third party to assume the role of a collector instead of the clinic. This is a subtle distinction, but an important one. Any issues or grievances that arise from payment (or non-payment as the case may be) are directed to the collecting third party rather than the clinic. In the minds of patients, clinics are care providers and billing third parties are collectors, even though the two are connected. As a result, patient satisfaction with the care they receive is left unscathed by feelings associated with medical bills. In the end, outsourcing medical billing can lead to better billing practices, fewer errors, better patient interactions and increased levels of patient satisfaction. Curious what outsourcing can do for your practice? Call PrognoCIS today to discover the difference outsourced medical billing can create for your practice.